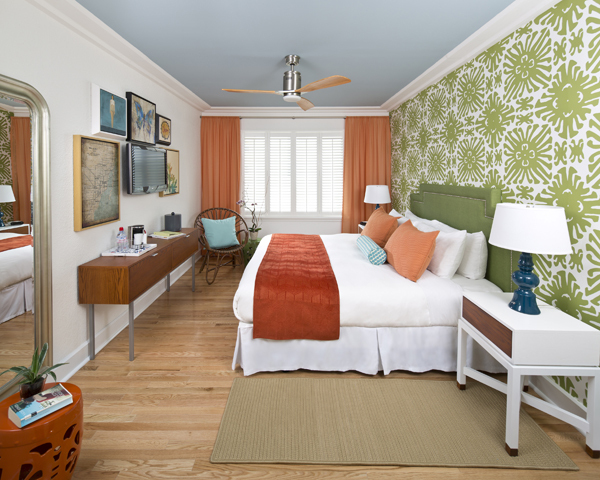 You can’t help waking up happy in the rooms at Circa 39 in Miami. My pillow at home is suffering from abandonment issues. 2017 was a busy year of travel for me; one that included stays in four properties later threatened by hurricanes, one built to showcase a new line of men’s products, one originally created to show off fertilizer and one that became a hotspot in NYC and generated publicity in the New York Post for the naughty behavior of its guests. Seems they found another use for those floor-to-ceiling windows other than enjoying the views of the city. 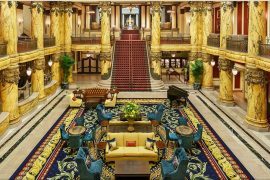 Here is my list of the 15 best US hotels in the US with links to read more on why these properties made my list. It’s been a tough year for tourism as so many places were affected by hurricanes. All four of these properties were in areas that were threatened by storms, and while three are fully operational, one is still been dealing with damage from Hurricane Maria, but hope to reopen soon. One of the more unusual hotels I’ve ever stayed in, NYAH – Not Your Average Hotel – is one of the most affordable hotels in Key West as it charges one price, whether you have one person or six. 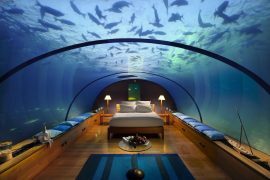 And your room is customizable to the size of your group. The location was perfect for my first trip to Key West, and with four pools you could always find a place to plunge when temperatures soared. We stayed at this property just a few days before Hurricane Harvey hit Houston and dropped an unfathomable one trillion gallons of water on the city. The Royal Sonesta survived just fine. We loved it for its location and excellent dinner at Axis. Shoppers will appreciate its proximity to Uptown Plaza and The Galleria. The condos in Turquoise Place are spacious and well-appointed. And we had a hot tub on our balcony! I had to vacate my huge, beautiful condo in Orange Beach, near Gulf Shores, a few hours early last September when Hurricane Irma threatened to show up and ruin everyone’s fun. We rebooked flights to get out of there early. Such a bummer because we missed the church service at Florabama, one of the best beach bars in the world. 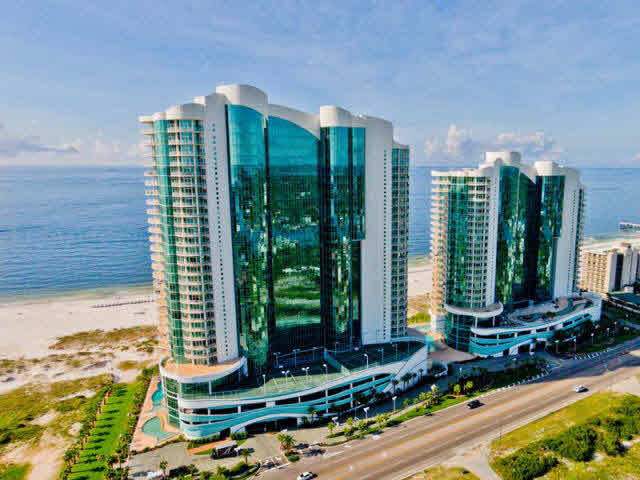 Turquoise Place is one of my favorite high-rise beach properties ever. The three-bedroom condos are huge with well-equipped kitchens and hot tubs on the balconies. I’ve been lucky enough to visit this property twice and was sad to see it suffered damage during Hurricane Maria in September, after surviving fairly intact after Hurricane Irma, the first hurricane that threatened the island. The resort is working furiously to reopen and is taking reservations for stays after August 31. They had hoped to open in the spring, but is proud to report that it is housing about 400 relief workers who are helping Puerto Rico to recover. It’s difficult to imagine what the living conditions of the staff are, as half of the island is still without power. El Conquistador is one of my top recommendations for Puerto Rico, so plan a visit there later this year. You’ll love it and will be helping the people of Puerto Rico recover. 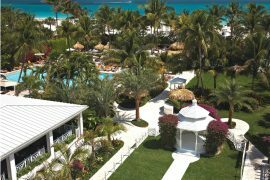 The expansive grounds are beautiful, the views unsurpassed and a highlight is a day spent on its private island. Another area threatened by hurricanes in 2017 was Cape San Blas. It was my first visit to this tiny, narrow island. You won’t find a huge selection of hotels on the island, so your best bet is to rent a home. We stayed in one booked through Sunset Reflections at Natural Retreats, a local affiliate of a larger company. The home was spacious, beautifully decorated and wonderfully quiet. My favorite feature was the pool right off the main living area. We arranged for kayaks to be delivered right to our house for use during the week. There’s a large selection of available homes to rent. When we moved to our current home three years ago, we gave up having a yard. The maintenance-free lifestyle is wonderful for people who travel as much as we do. To be clear, I never actually did much yard work. I would just feel guilty about not doing it and lament over the sorry state of our yard. Our neighborhood has plenty of sidewalks, trees and parks. But it’s still nice to get away from the city to resorts with plenty of acres of land. And someone else to take care of it. 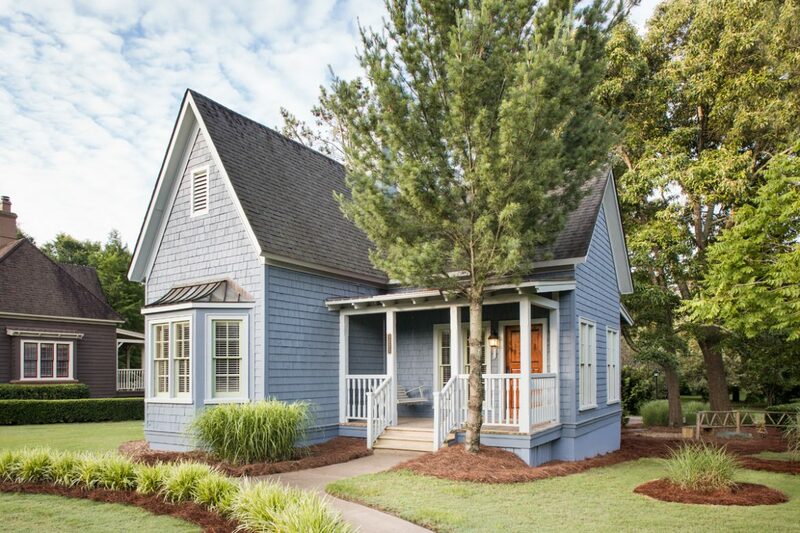 I could move into one of the cottages at Barnsley Resort. A bartender told us a woman from Alabama does – for a month every year. Barnsley has long been a favorite retreat of mine, and my husband and I have spent many cozy hours in front of the fireplace in a cottage, biking around the 3,000-acre resort about an hour north of Atlanta, and even trying our hand at shooting clays. Turns out he’s an excellent shot, while wildlife everywhere can breathe a sigh of relief when they see me hoist a shotgun to my shoulder. The resort also has a pool, spa, hiking trails, restaurants and golf. Look for the 55-room Inn at Barnsley Resort to open early this year. This golfers’ paradise in northern Alabama has its roots in the fertilizer industry. Owner David Pursell’s grandfather ran a fertilizer company for local cotton farmers. They later turned their focus to golf courses, and constructed a top-notch demonstration golf course to sell their fertilizer. After that company sold, the family turned the property into a resort with an events facility, ORVIS sporting clays course and a charming spa. Accommodations include cabins and cottages. The resort is increasing its inventory of rooms with the addition of a 40-room inn in March. My favorite part was tooling around the grounds in the golf cart provided for our use during our stay. Built on top of a plateau in the scenic Blue Ridge Mountains, Primland is for the outdoorsperson interested in hunting, fishing, shooting clays, horseback riding or kayaking. It’s also for anyone who wants to enjoy delicious meals while gazing at spectacular scenery or lounging in the indoor pool. A highlight is the Observatory built right into the main lodge. Guests can stargaze and learn about distant planets. In addition to the main lodge, accommodations include large houses and tucked-away treehouses. The inviting front of the Elements Treehouse, built by Dove to introduce a line of products for men. Speaking of treehouses, I indulged in a few bouts of childhood nostalgia during stays in two this year. 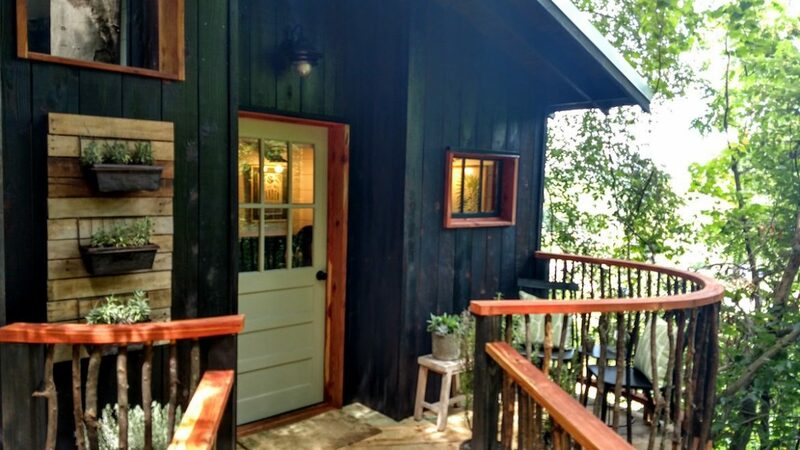 The Elements Treehouse near Chattanooga was built to showcase a new line of care products for men. While the one-bedroom with a loft was intimate and delightful, the star of this treehouse is the bathroom, with the fanciest showerhead I’d ever seen. The best part? You get to shower with a tree. It’s encased in glass, so you can’t really hug it or use its branches to scratch your back. But you can look up and admire its upper branches through the glass skylight. The treehouse is on the side of Lookout Mountain, bordering Georgia and Tennessee. You can’t really cook a meal in the tiny kitchen area, but there are plenty of restaurants in nearby Chattanooga. My second treehouse stay was close by on 200 acres in a valley in north Georgia. Two quaint treehouses are tucked in the woods in Candlelight Forest, a resort with an events facility and plenty of old-fashioned fun for families, including cane pole fishing, badminton, hiking trails and s’mores making on fire pits. Our treehouse had a large, stand-up second floor set up perfectly for kids, with four beds, small table and a gate to keep them safe. Walk in the front door of Circa 39 and you’re instantly in the Miami frame of mind. The brightly colored décor, wicker furniture and a glimpse of the pool off the bar let you know you’re in for a fun stay. I loved the cute palm-tree encased courtyard towards the back, and the craft cocktails at the WunderBar were a highlight. Travel tip: Head there for WunderHour, a daily happy hour with discount nibble and drinks. The Palms is a sister property to Circa 39, but like many sisters, couldn’t be more different. If Circa 39 is the zany, fun, salsa-dancing little sister, The Palms is the quieter, more elegant and sophisticated one. One peek at the soothing colors, white columns, cascading chandelier and soaring ceilings of the lobby and you’ll see the difference. Located right on the beach with access to Miami’s four-mile boardwalk, The Palms has cabanas for rent, a tiki bar, tropical gardens and a chef’s garden where the chefs plucks produce to work their magic in Essencia Restaurant. This small Spanish-style bed and breakfast bordering the historic area was the perfect location for my first trip to St. Augustine. A former private home, the property has operated as an inn since 1998. I enjoyed a nightly wine hour and an extensive hot, buffet breakfast. Guests are greeted in their rooms with a sherry decanter and snifters, and freshly made desserts are available every evening. Two others that made my list this year were new properties in Boston and New York, both renovations of old buildings. My husband found this one for a business trip to Boston and it turned out to be an excellent choice for our trip. Located in a former red light district downtown, now a trendy area known as Downtown Crossing, The Godfrey is located close to shops and Faneuil Hall and walking distance to major historic sites and Boston Common. While the façade of the 242-room hotel is Gothic Revival, the interior space is contemporary and sleek.Our room was comfortable, although a bit noisy from the bar downstairs. We used these floor-to-ceiling windows to enjoy the view of New York City. Other guests apparently used them to put on live adult entertainment. Forget the traditional check-in desk and hotel clerks. Guests at the ultra-hip Public Hotel check themselves in on an iPad, craft their own keys and should they require assistance, turn to a Public Advisor. 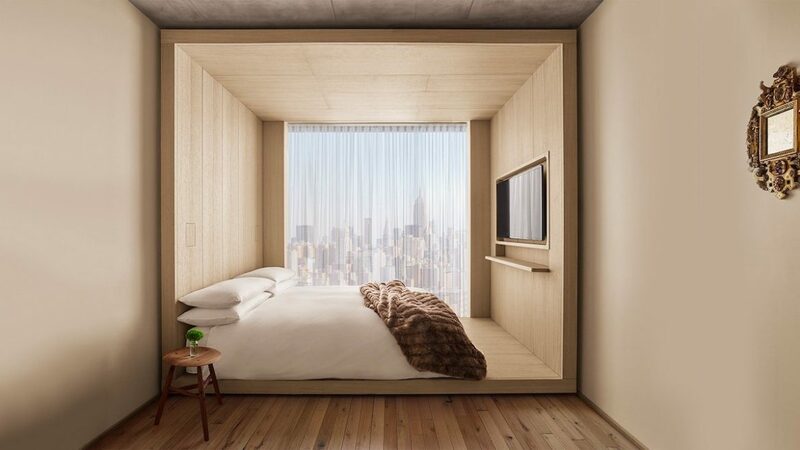 I loved the sparse furnishings and the bed set longways against the floor-to-ceiling windows with views from the hotels’ Lower East Side location. It’s those windows that have the residents fuming as they complain about their view of guests engaging in adult activities. Be prepared to encounter active night life if you stay here. We left a quiet hotel one evening and returned to a street full of beautiful people surging in line to get into the lounges and rooftop bar.